This historic English violin is a remarkable work by London luthier John Crowther, and as an exceptionally successful example of its style, it reflects the major influence that the baroque Stainer model had on European violin making of the late 18th century. Several dated hand-written signatures on the inside of the body confirm the violin's provenance as one of the few clearly identifiable instruments made by John Crowther. 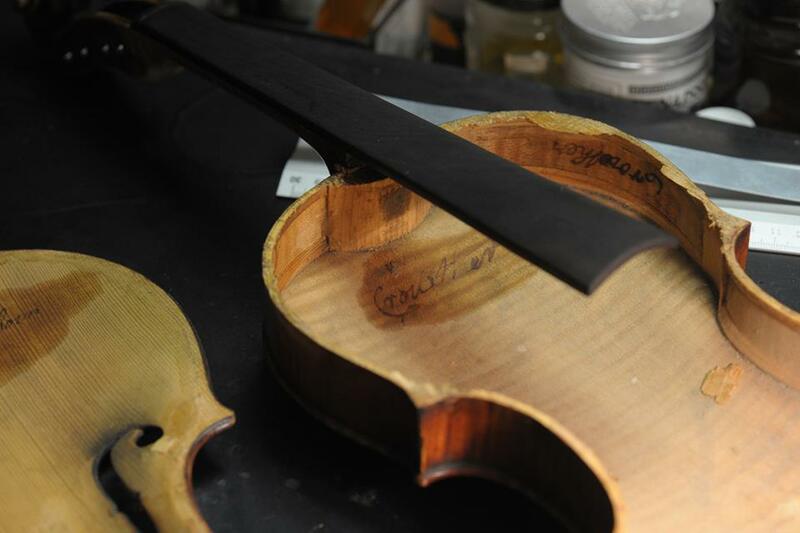 After all, like many very good masters throughout the history of violin making, he worked primarily on behalf of others, including John Kennedy’s famous London workshop, which sold his pieces under their own brand. The fact that John Crowther directly marked this instrument as his own may be have been his attempt to establish a name for himself in the field in which he had made his living for nearly 30 years: he had founded his own workshop in 1788, and it is assumed that this violin was intended for that name. Crafted with a great love of detail, its delicate aesthetic and its large, silvery sound are a wonderful match for the needs of the sophisticated cosmopolitan clientele that John Crowther had to win over when he opened his workshop. As a classic Stainer model, the violin has a high table. The elegant light-brown varnish casts the attractive grain of the brilliantly selected tone woods in its finest light and subtly accentuates the singular beauty of the tight flames on the one-piece maple back. We are able to offer this instrument at an unusually low price due to a few visible restorations performed on the upper left edge of the top, and in the course of meticulously setting up the violin, our luthiers were able to confirm that these repairs were well-executed and have no affect whatsoever on the instrument's acoustic qualities. After having matured for over two hundred years, it is in peak musical condition and lends the authentic character of its epoch to nuanced interpretations.